Tags: Design thinking, innovation, human-centred enterprise. 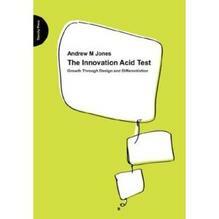 "Author Andrew Jones looks at the connection and consistencies of the world's most successful companies which are transforming the way we live in the Innovation Acid Test. He describes the book as being about the gap between the rhetoric about innovation and the commitment to it. He looks at seven companies which innovate with their products and services and the processes by which they get to their customers. Innovation is defined as "people generating value through the implementation of new ideas"
"The disciplines of architecture, design and anthropology are key elements of the agenda for innovation and there are examples of how they are incorporated into daily business. The British architect, Christopher Alexander, suggests that the built environment can potentially "come to life" as an extension of nature if it is conceived of and executed according to what he calls "the timeless way of life". Currently 70 per cent of Americans dread going to work, so there seems to be scope for improvement here. Design is not to be seen as added value but the corporate strategy. It is about growth through differentiation, innovation and sustainable competitive advantage. If the anthropological perspective is to be judged by the growth in ethnographic consultancies, then its importance is finally and logically being recognised in a role beyond marketing and advertising. There is a major recruitment and retention issue in relation to the post 'Baby Boomer' Generations X and Y and a perceived need for T-shaped employees who will combine doing with empathy. Note the SAS Institute, with its "lavish" employee benefits for its 6500 employees, with revenues of $2bn, is saving $85m a year because of its industry leading employee retention. The centrepiece of the book are the studies of the seven major innovators. The final chapter is designed to help managers make the transition. You really need to read this book to get the best out of it." "The case studies will be very helpful in giving students, who are already in senior management positions, examples of successful innovation in the workplace. Also it is important that the students can relate theory to practice and I believe this book does that very well." "I think the book is excellent - it is followed very nicely with the current CNBC series on innovation, hosted by Maria Bartiromo . If I were able to teach a course at my college on creativity and innovation, I would definitely use it!"